Emm-Bee Motorhome dealers are one of the UK’s leading full service suppliers of motorhomes for sale: both new motorhomes and used motorhomes. 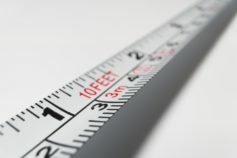 Despite our size, we are still a family-run business who place a premium on providing real customer care. 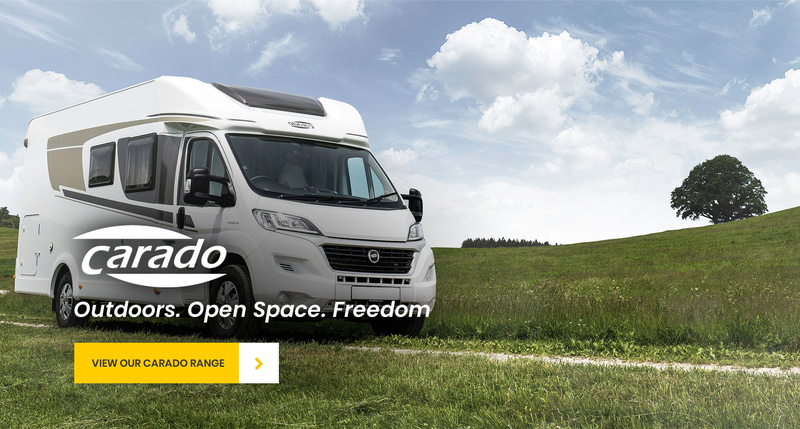 We are main motorhome dealers for outstanding brands like Burstner, Chausson, Bailey, Carado and Laika motorhomes. And, we have everything you need in one place: from motorhome sales and repairs to motorhome accessories and motorhome servicing. 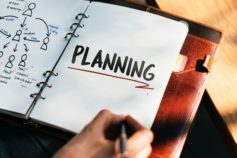 And, of course, great advice to help you and great deals on motorhomes. Get in touch today. Its official, we are all in love with Morgen! She is a beautiful little 8 week old Viszla brought in by the Walkers. 😍😍😍 Thanks for bringing her to see us, we think she liked Abi too! Emm-Bee Motorhomes is the North West's number one destination for you to visit for new and used motorhome sales and servicing. For 33 years our family business has been delivering great value and excellent customer service to our customers, and the third generation within the business continues this tradition. We stock new motorhomes from five well-known and respected brands: Burstner, Chausson, Bailey, Carado and Laika. At our site, we also stock a high number of used motorhomes in excellent condition. These are for sale at great prices, fully warranted and professionally inspected. You also have access to an expert, friendly team committed to finding the right motorhome for you. There really is no better option for your Motorhome purchase. Emm-Bee motorhomes service centre is the essential destination for any of your servicing or repair needs. We are specialists in ensuring that your motorhome retains its best future value, and remains safe on the road for you and your family. Our highly skilled senior technicians are fully qualified and experts in the leisure field. 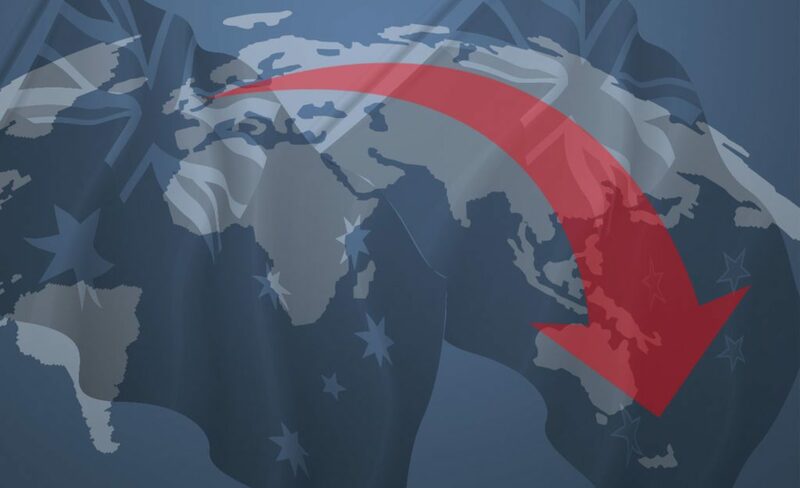 They can handle all your motorhome repairs, while our motorhome parts finding service is second to none. Also, don’t forget to visit our well-stocked motorhomes accessories shop before your next holiday. Buying a new or used motorhome is a big investment, so we would love you to come and visit us at our showroom. We’re just off the M66 motorway junction north of Manchester, and we are really easy to get to. Also everything you see on our site, we stock so at any one time we have over 60 vehicles in stock. Come test drive, touch and talk to us about our outstanding motorhomes for sale. Burstner motorhomes have an enviable reputation within the motorhome industry for exceptional luxury and comfort. When it comes to the internal finish, new Burstner motorhomes are simply unmatched. 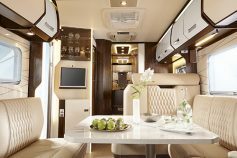 Stunning interiors, incredible quality of fittings and sleek lines give the feel of a high-end hotel on wheels. Driving too is a pleasure, with modern driving aids including reversing cameras, and engines which effortlessly take the weight. 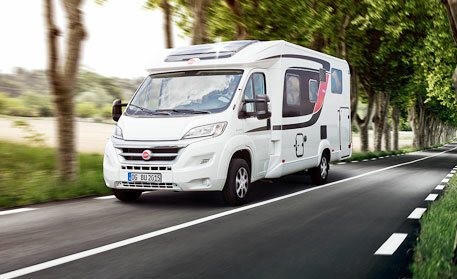 The only downside with a new Burstner is that on arriving, you might not want to step outside! Whether it’s a two-berth retreat for a couple, or a family home, our experts can find a new Burstner motorhome to match your needs. Combine this with unrivalled German quality of build and the perfect package is the result. Give yourself a treat by taking one of these luxury vehicles for a test drive today. Getting way off the beaten track and making wonderful memories make life worth living. With a Bailey Motorhome, you're free to get out and discover new destinations whenever you like. Whatever the time of day, whatever the weather, the world is waiting for you. 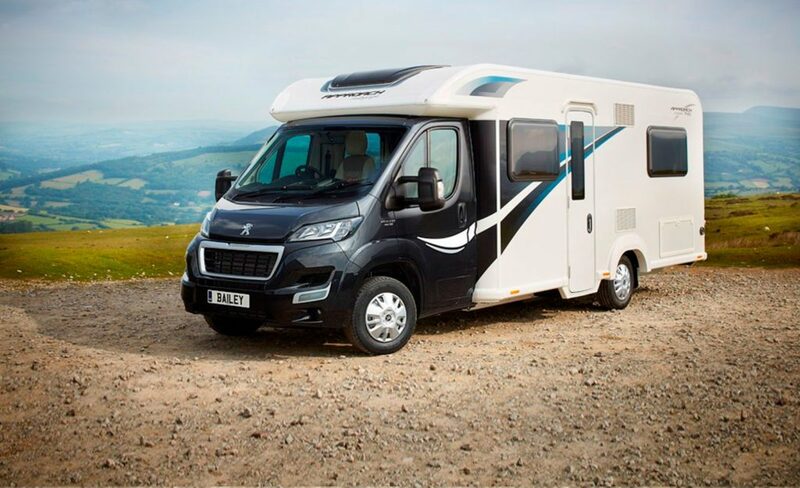 From the responsive and powerful Peugeot engine to the extra wide living areas, the Bailey sets itself apart from the competition. There is no season too cold for the Bailey motorhome thanks to the unrivalled Alde programmable heating system. The Bailey Autograph standard specifications are the best in the industry, with a 100w Solar panel, and a Fiamma F45S wind out awning among the equipment included. The ingenious design throughout creates a feeling of space and light, without compromising comfort. This is why Bailey is number 1 in the UK. 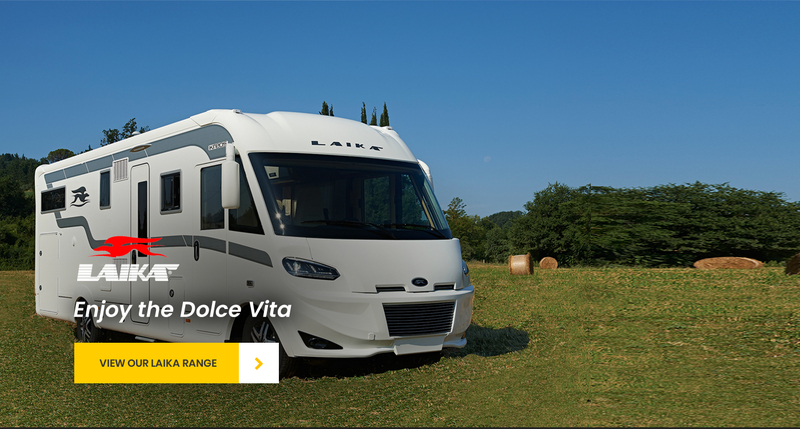 Laika motorhomes take their inspiration from Lamborghini: exceptional German build quality with world-renowned Italian design. With the most modern and advanced factory in the industry, Laika believes that quality starts on the production line. This brand develops tried and tested layouts from its Tuscany base that just simply do the job better than the competition. With market-leading garages to house a large motorcycle or extra luggage for that extended trip away, Laika delivers. Laika has a huge market in demanding northern winter markets, such as Norway and Sweden, so a chilly night at the ski resort is no problem. Combine this quality with unrivalled luxury and you have the perfect package. From Corian worktops to full grain Italian leather the Laika is a luxury apartment you can park wherever the adventure takes you. As the biggest Laika dealer in the UK come and visit us to see the difference. Chausson Motorhomes deliver innovative design combined with exceptional value for money. 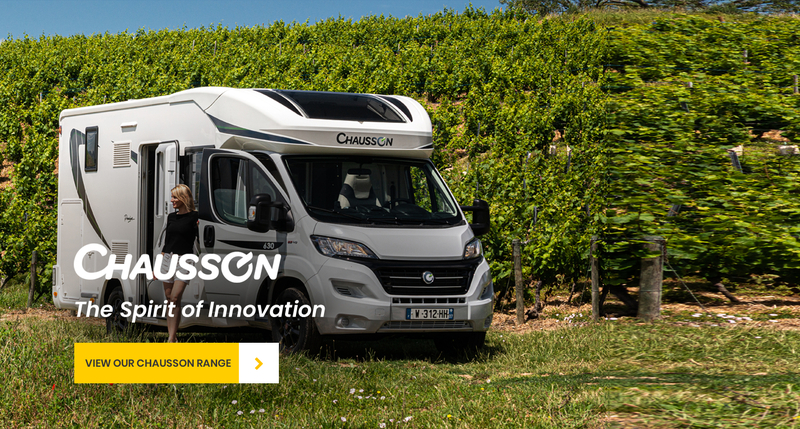 As one of the largest brands in Europe, Chausson motorhomes prove popular year after year. With the unique option of either a Ford transit or Fiat Ducatto power unit they offer real versatility. Layouts are numerous and are a strength of this brand, being the first with electric fold away beds and amazing electric bicycle garage racks. Whether it’s a motorhome for a family or a couple the Chausson is an excellent choice and will deliver comfort and quality on any adventure. Come and visit Emm Bee, the biggest Chausson dealer in the North West. Poll: Which Types Of Holidays Do You Love? 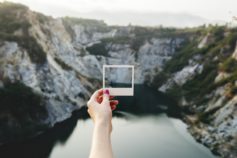 Is A Motorhome A Good Investment? 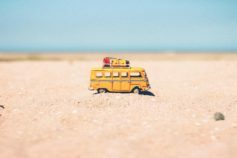 What Size Motorhome Do I Need? Why Are Motorhomes So Expensive?